Fantastically Delicious. Included in Every Reservation, Every Day. 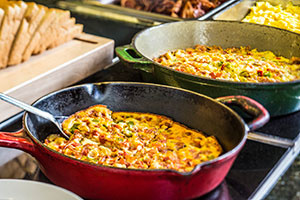 Join us in the atrium for a free breakfast buffet every morning. Includes: scrambled eggs, breakfast potatoes, bacon, sausage, housemade oatmeal, pancakes, french toast, fresh fruit, yogurts, cold cereals, juice, coffee, and more. The perfect start to the day’s adventures.